There were mixed emotions for Head Coach Dan McFarland as Ulster secured five points against the Southern Kings on Saturday night at the Kingspan Stadium. The win puts Ulster into second place behind Leinster in Conference B, however the loss of Louis Ludik, Marty Moore and Darren Cave adds to the growing list of injury woes ahead of Saturday’s huge European Champions Cup quarter-final clash with Leinster. Saturday’s fresh injuries leave Ulster depleted in midfield, with Luke Marshall still not fully fit following an ACL injury and James Hume ruled out after breaking his ankle in training last week. “I have got to wait and see but you saw the same as me and it did not look good,” said McFarland of fullback Louis Ludik’s injury after he was helped off the pitch by the medical team just nine minutes into the game. McFarland joked he may have to call upon former Ireland centre and Ulster’s defence coach, Jared Payne, to fill the gap in midfield. “Jared Payne’s wondering whether he should play, but we’re saying definitely not – you’ve had your chance,” laughed McFarland. On a more positive note, McFarland praised Ulster number eight, Marcell Coetzee on his return to action from a hamstring injury sustained in the last European outing against the Leicester Tigers. Despite some superb individual performances, McFarland reflected on his sides rustiness and tendency to turn the ball over or cough it up at crucial moments. Indeed, although the win was somewhat spluttering, Ulster ran in 5 tries tuart McCloskey, Rob Lyttle, Robert Baloucoune, Marcell Coetzee and John Andrew. The front row did well – Herring was dynamic in his ball carrying and was solid at the set-piece. Andy Warwick put in a serious shift, tackling well can carrying over the hard yards. It was reassuring too, to see Herbst come on at loose-head and create issues for the King’s scrum. Rob Lyttle looked dangerous in attack, squeezing his way through the King’s defence on a number of occasions – enough to earn him the man of the match award. Michael Lowry and Bobby Baloucoune are improving with every game they play and hardly put a foot wrong. 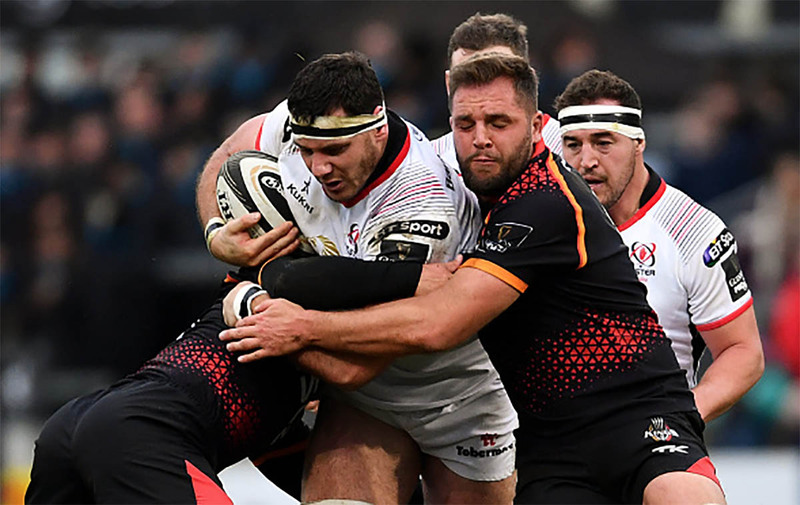 Stuart McCloskey will have divided opinion – his size and power were a definite asset to Ulster however, his once frustrating habit of forcing offloads has now seemingly turned into an inability to pass. He took his try remarkably well however, and remains an important focal point of Ulster’s attack, often drawing in several defenders. Saturday’s win completes an impressive run in the PRO14 for Ulster, taking 21 points from a possible 25. Ulster now have three games remaining in the PRO14 with away games against Glasgow and Edinburgh, and a home fixture with Leinster. “In the forefront of our minds is that we have to go to Glasgow and Edinburgh with their Scottish internationals back and we have the best team in Europe in the last game of the season, so we’re under no illusions to the size of the task ahead of us,” said McFarland. Of course, Ulster’s focus will now change swiftly to Saturday’s Champion’s Cup quarter-final clash with Leinster at the Aviva stadium against defending champions Leinster. Although it is hoped Ulster’s fourth consecutive PRO14 win will give Ulster significant momentum ahead of this weekend, McFarland notes that, while Leinster rested a number of key players in their game against Edinburgh this weekend, that was a luxury Ulster could not afford. Despite some excellent performances this season, particularly in the Champions Cup competition, McFarland is confident Ulster have a lot more to offer. Indeed, Ulster will now focus their preparation on producing a memorable performance on Saturday against Leinster, who are considered by many to be strong favourites. Indeed, Ulster will require an exceptional performance to challenge this great Leinster side. It is worth bearing in mind Leinster have injury problems of their own – Robbie Henshaw, Devin Toner and Josh van der Flier are all expected absent and several players will still be reeling from Ireland’s six nations capitulation. For Ulster, finding a centre partner for Stuart McCloskey will be crucial as will proving the fitness of Marty Moore ahead of Saturday – the pack’s cornerstone. Given the sizeable Leinster contingent in this squad, Ulster’s ‘blue streak’ will have a point to prove in Dublin this Saturday. WATCH: Kings get a Red & Yellow in one TMO review v Ulster.